Life in Mascara: Literally e.l.f. i think i have stated before what a HUGE fan of e.l.f. i am and have been more and more pleased with their constant product development. they are predominately an internet based makeup line but it seems like everyday a new e.l.f. stand is popping up at my local grocery store, the gas station ( GENIOUS! ), and Old Navy. i was instantly lured in when i saw that my grocery store finally was carrying e.l.f. (which stands for eyes, lips, and face and as you can see i picked up something from each of these categories hence my clever post title). new in was their Matte Lip Colors and i picked this up in the shade Rich Red. oh guys, this product is heavenly. so rich and creamy and yet matte. not as matte as per say MAC Ruby Woo, but matte enough. the pigmentation is to die for. and can we all focus on the fact that it is only $3? yyyeeeessss!!! next i picked up two of their Essential Smudge Pot which can be used as both an eyeshadow and an eyeliner. they are pigmented, they are creamy, they are so blendable. i used my finger to apply the lightest shade which was Crusin Chic and did the same when i applied Brownie Points but used a MAC 216 brush to smoke out the edges on this one. they are very similar to Maybelline Color Tattoos but again at only $3. i. want. them. all. finally i picked up a Studio Contouring Blush and Bronzing powder in the shade St. Lucia. now we have seen the blush and bronzer combo reproduced over and over again since NARS basically created it but none like this. 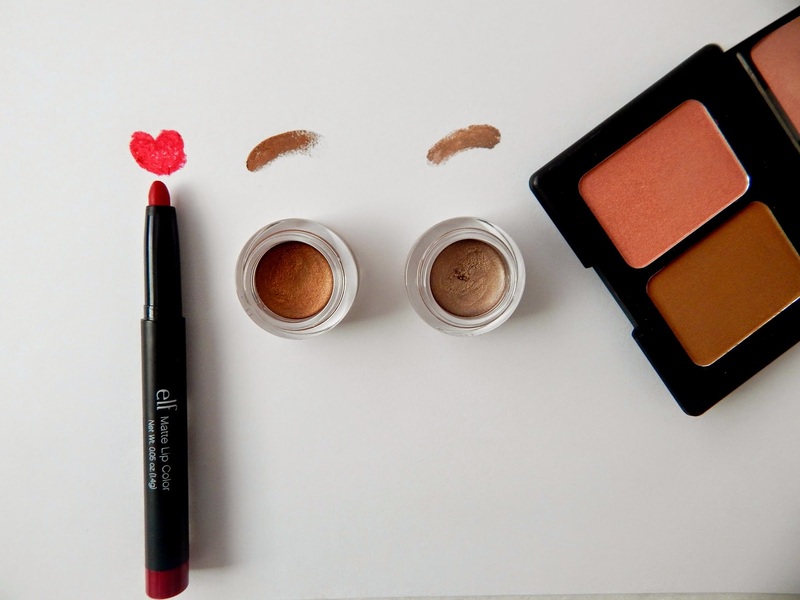 available in 4 different shades, these blushes are very highly pigmented. a little goes a long way and they last all day. also this bronzer is wonderful. rich, blendable, and buildable. i used it one day to contour and another day as a sheer bronzer on the cheeks. and yes, you guessed it $3 again. e.l.f if you are listening, i freaking love you! i think you need me as your spokesperson because i am already doing the work for you. but in true honesty, keep up the good work and the amazing products. and find out whoever is responsible for putting your items at a gas station and give them a raise!